A newer version of this extension is available. See Magento 1 Extension v2. Sailthru’s extension for Magento 1.x is designed to help clients who use the Magento platform to quickly and seamlessly get started with Sailthru’s API. Note: If you are using Magento version 2.x, use our Magento 2 Extension. This extension is designed to be a turnkey integration for the vast majority of e-commerce stores built on Magento 1. It can, however, be easily customized and extended to suit custom needs. Capture of users events including login, logout, abandoned cart, and purchases. Adding new users into a Sailthru list upon registration. 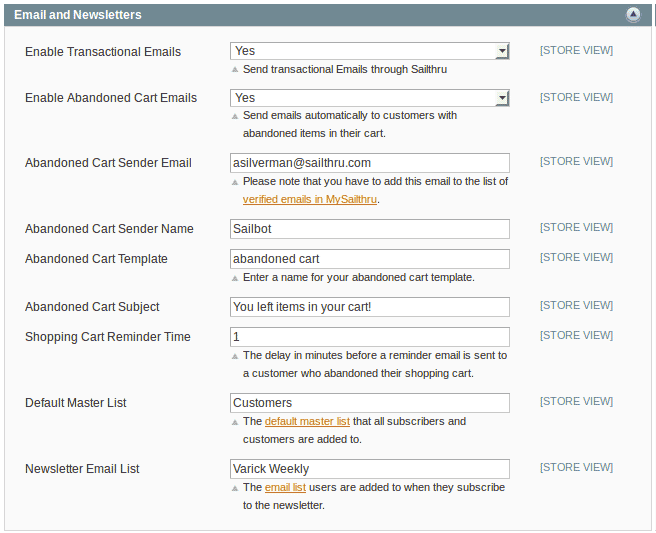 Allowing users to sign up for a separate Sailthru list for newsletter subscription during registration. First, have your developer download the plugin from GitHub. Instructions how to install the plugin are located in the GitHub repository’s README. This code is all you need to have basic functionality working. Note: Looking at app/code/local/Sailthru/Email/etc/config.xml, a developer can see what Magento events the extension is watching, as well as what file and function are being fired. After the extension is installed, log in to the Magento Account, Click System, and then Configuration. Next, in the left-nav menu, under Sailthru, click Settings. Enable diagnostic logging as needed. 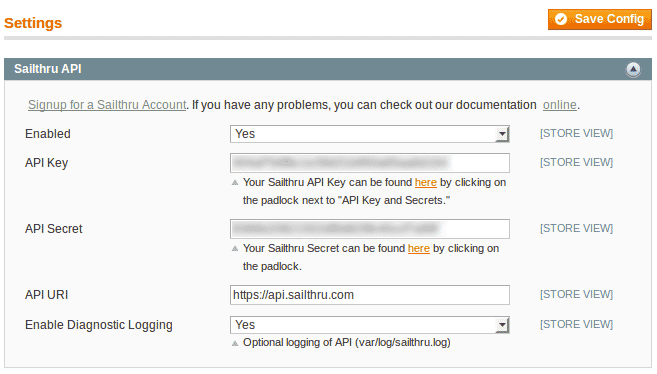 *We now recommend using an application-specific API key. To obtain an application-specific key and secret, talk to your Customer Success Manager. Open the Emails and Newsletters block, and adjust the settings you wish to use. Enable Transactional Emails allows you to send Magento’s transactionals through Sailthru which allows Sailthru the ability to track and report open and clickthrough from the transactionals. Enable Abandon Cart Emails allows Sailthru to automatically email a customer after a set amount of inactivity in Magento from the customer’s cart. The Magento Extension allows you to set which email addresses the Abandoned Cart will send from, the name that will be displayed for the email address, the Abandoned Cart email’s subject line, and a Sailthru template to use for the email. The Reminder Time determines how long from last cart activity to send the message. If a customer ends up purchasing their cart, the Abandoned Cart will be reset. Default Master List allows you to set the list that all users are added to. Users will be added to this list upon user registration. Newsletter Email List allows you set a Sailthru list that users will be added to if they check the Newsletter subscription checkbox during user registration. Open the Horizon tab to set a domain for Horizon, enabling it across the site. Horizon enables you to gather data on your users’ individual interests based on activity on your website. You can then dynamically target users with this intelligence based on their purchase, browsing, and explored interests. The Magento Extension sends Abandoned Cart and Purchases through the Purchase API, allowing for real-time customer interactions with your customers. With every Purchase API call, the Magento extension passes item name, price, quantity, and more as vars. These vars allow you to create highly customized interactions and emails using Zephyr, e.g. coding a template that uses a different color background depending on the products in the cart. Custom code can also be implemented to add additional vars to transactional sends.